After my recipe featuring how much I love tofu “ricotta”, I thought I would highlight a similarly made filling in a completely new way. 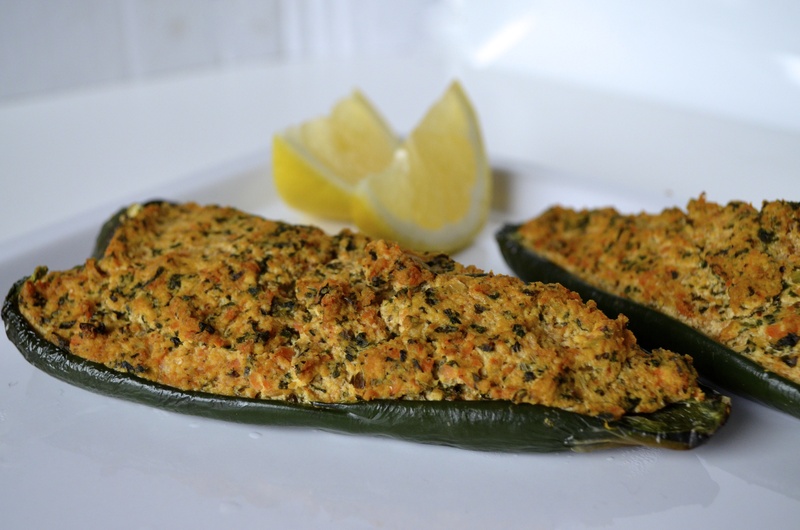 Here it features the stronger flavors of tahini, mustard, and smoked paprika, pairing well with the spiciness of poblano peppers. Set the oven to broil. Lightly oil a baking sheet. Put the poblanos on the prepared pan. Sprinkle with salt and pepper. Broil, about 5 minutes per side, until they just start to blister and become tender. Remove, and set the oven to 425 degrees F.
Meanwhile, heat the olive oil in a skillet over medium heat. Add the onion and carrot and cook, about 5 minutes, until softened. Add the kale and garlic and cook until wilted the kale is wilted, about 2 minutes. Remove from heat. Put the onion mixture, tofu lemon juice, tahini, mustard, paprika, and a generous pinch of salt in the food processor. Process until well combined and nearly smooth, scraping down the sides if necessary. Adjust salt and pepper to taste. Spoon the mixture into the peppers. Portobello mushrooms. Bake until heated through and the topping of the filling is browned and firm to the touch, about 20 minutes. Serve warm. Developed for a back-to-school article, these veggie boats were created with kids in mind. Kids, we know, are budding architects, and building their own lunch keeps them interested, so keeping these unassembled let’s them have some fun with their lunch. To make the creamy tofu filling, put the tofu, nutritional yeast flakes, basil, 2 tablespoons of the lemon juice, the tahini, and garlic clove in the food processor. Process until smooth. Season with salt and pepper to taste, adding lemon juice if desired. 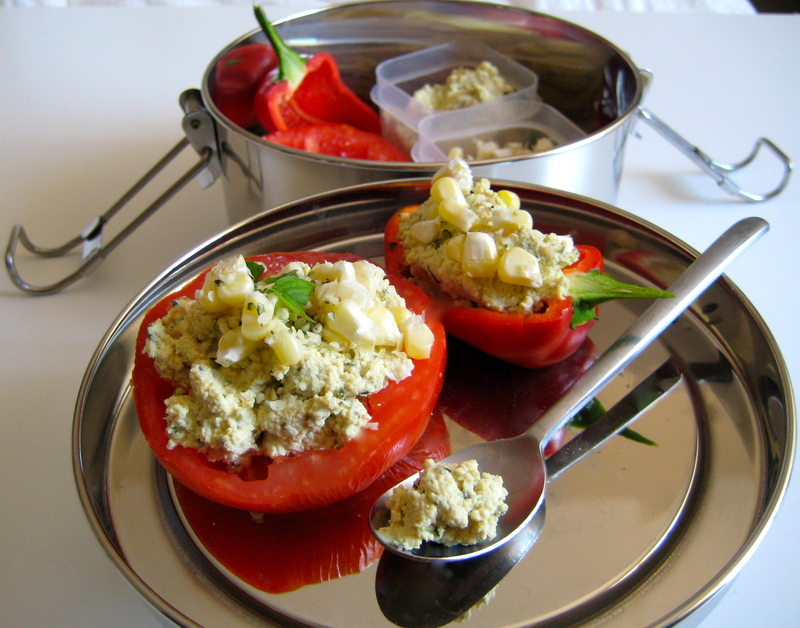 Depending on your child’s appetite, hollow out tomatoes and peppers and put in a container. Put some of the filling in a separate container. Mix together corn and hemp seeds in a third container. 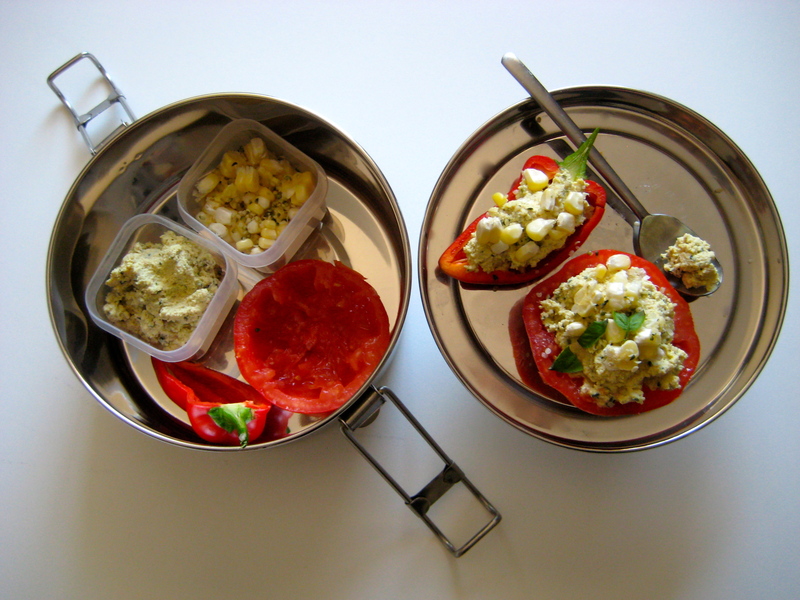 Pack the ingredients in the lunch box with a small spoon for assembly. By using beans as the main ingredient in the sauce, you get a hint of hummus taste, extra fibre and protein, and a hearty, satisfying taste. 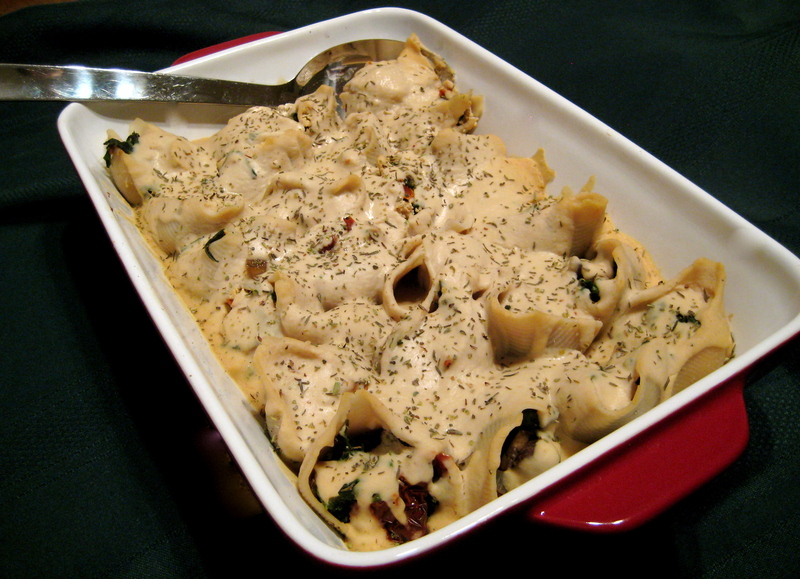 The filling is infinitely adaptable — and amazing with mashed butternut squash and spinach, too. To roast the garlic, preheat the oven to 425 degrees F (230 degrees C). Thinly slice the top of the whole garlic bulb, exposing the cloves. Wrap in foil. Bake until soft, about 45 minutes. Bring a large saucepan of salted water to a boil. Prepare pasta according to package directions. While the noodles are cooking, prepare the filling. Crumble the tofu in a large bowl. Stir in the zest and nutritional yeast. Heat the oil in a large skillet. Add the onions, cook until softened. Add the kale, mushrooms and Italian seasoning. Drain the tomatoes, reserving the liquid. Add the mixture to the tofu, along with the sundried tomatoes. Mix to combine. Season with salt and pepper. Meanwhile, put all of the sauce ingredients in a food processor. Use only half of the garlic and half of the lemon. Whizz until smooth. Add additional garlic, lemon, salt, pepper and nutritional yeast to taste. Set aside. (I use the whole bulb and whole lemon, although different sizes may be according to taste). Use the sundried tomato water to thin to a sauce consistency. Once the noodles are cooked al dente, drain well. Assemble them in a 9×13 glass baking dish. Divide the mixture in the noodles. Top with the sauce. Cover with foil and bake at 350°F (180°C) for 30 minutes. Let stand 10 minutes before serving.